1. 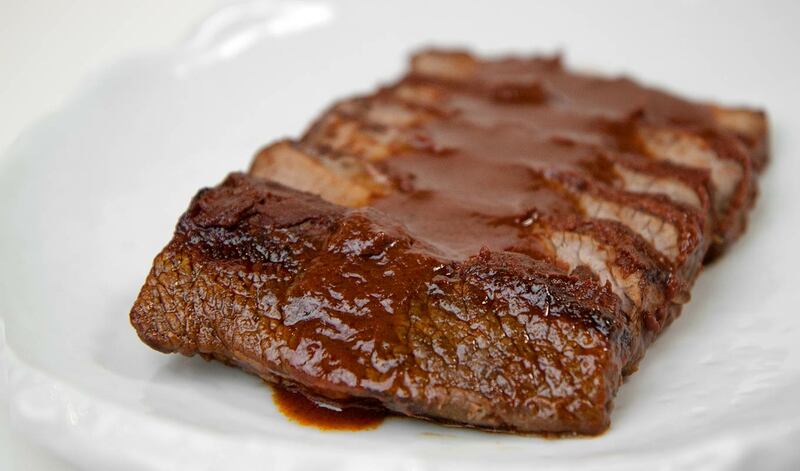 Rub the brisket thoroughly on all its sides with the barbecue rub, and allow it to come to room temperature. 2. In the pit of a covered grill, build a very small fire on one side as far up against one wall as possible. Place the brisket on the grill on the side opposite from the fire so that none of the brisket is directly over the flame. Put the top on the cooker, pull up a chair, and grab the cooler. This is where a person learns about the Zen of Barbecue. You gotta keep the fire going, but very quietly. If you’ve got a thermometer on your covered grill, you want to keep the temperature between 180° and 220°F. Remember, “Slow and low is the way to go.” You have to figure out your own personal refueling policy. The one I like is one handful of coals or wood chunks to every beer. This goes on for about 8 to 10 hours or however long you can make it, the longer the better. Don’t be scared by the darkening of the exterior, the outside of the brisket will be superdark—my personal favorite part. 3. Upon completion, pull the brisket out, trim off any excess fat, and slice it thin. Serve with barbecue sauce on the side—no pro would ever cover properly cooked brisket with sauce, he’d just dab on a touch. Obviously the key here is a tremendous amount of patience and a day when you want to do nothing but sit around. But the end product is one of those great culinary events that results from spending a lot of time doing something that is relaxing and enjoyable. Make sure you have plenty of tall boys for eating this. In my estimation, beef brisket just might be why the barbecue process was invented. My research, sketchy as it is, shows that there was a strong German immigrant community in Texas around the turn of the century. It has some of these Germans working in the booming Texas cattle industry, and others working in butcher shops, what with their strong background in butchering and charcuterie. It being common knowledge that butchers are constantly trying to turn tough or inexpensive cuts of meat into a usable product that brings a higher cost (witness sausages and pâtés), it has these German butchers faced with the brisket. This cut of beef is particularly unwanted because of the huge percentage of fat that runs not only on the surface, but throughout the cut. Traditional technique would braise or pickle this cut to tenderize it, but the brisket also has a lot of beef flavor. In my personal opinion, a very smart German butcher who was looking for a way to market this cut barbecued it. We’re not talking here about the open-pit roasting that was already popular in this area, but rather closed-pit cooking, in which the cooking is done by convection rather than conduction. It is similar to braising in theory, with the smoke replacing the water. It is cooked at very low heat for a long period of time, and the high fat content protects the meat from drying out but also disappears through the 10- to 18- hour cooking process. What you are left with is very tender meat with little or no fat and a tremendous smoky beef flavor. I think the meat and the process were literally invented for each other. These are guidelines for the closed-pit barbecuing of brisket, a basic technique with many variables which is wide open for personal interpretations. SERVING SUGGESTIONS: I like this with Hot Pepper Corn Bread, Grandma Wetzler’s Baked Beans, and Tidewater Coleslaw. Your Basic Grilled Corn is good, too, and don’t forget the watermelon.